Back in the early nineties, I was working with a bunch of reasonable folk at what was then called Bell-Northern Research (which eventually became an integrated part of Northern Telecom). I was always an adventurous sort, and it just so happened that I also liked astronomy. 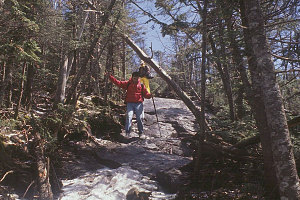 My then-manager, Brian Connell, also had had a fondness for life in the outdoors - he had done several outings on his own in New Hampshire climbing Mount Washington. A third co-conspirator was Gilbert Benoit, an eclectic software developer / homebrew linguistics fanatic who had spent some time traipsing about in the alps. 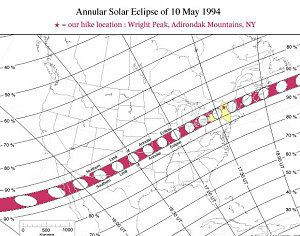 At some point in early 1994, while poring over an issue of Astronomy magazine, it became apparent to me that an exceedingly rare event was about to pop right into our laps: a total annular eclipse of the sun. This type of eclipse occurs when the moon eclipses the sun while while at its farthest point away from Earth in its orbit. 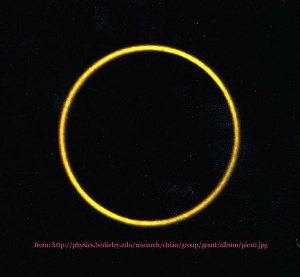 The moon is not close enough to completely cover the sun, so instead the eclipse produces a very thin ring of sunlight with the moon in the center. There was one problem, however: the path of totality did not pass directly over Ottawa. It did pass over the adirondack mountains of northern New York state. 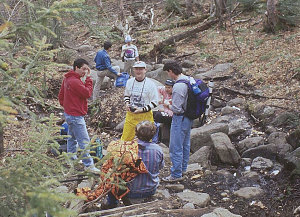 It was at that point that the thought began to germinate : combine an outing into the mountains of the adirondacks (I had never done any real mountain hiking at this point) with an outing to view this rare celestial event. It was a great conjunction of two interests of mine - and I wanted to get it to happen. 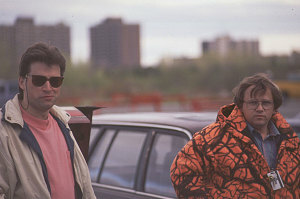 Armed with extra fervor, I approached the two most malleable subjects on these matters: Brian and Gilbert. Gilbert, brimming over with experience and gear from his recent 'alp'ine excursion, needed little convincing. Brian, having grown tired of climbing Mount Washington by himself, and being an all-round easygoing sort, was also easily persuaded. An added bonus to this was the fact that he was our manager - especially useful since the eclipse was to take place on May 10, 1994 - A tuesday. Brian graciously offered an opportunity to the rest of his group: you can have a day off, if you want to come with the rest of us on a hike. They said yes, all of them. What they didn't know was that this was no piddly little hike up a piddly mountain on a warm day in May.........and for that matter, neither did I. So just who was in our group in May of 1994? Department 1B33 was composed of : Brian Connell (M), Gilbert Benoit, Bob Gibson, Gord Walls, Andrew Lavigne, George Zhao, Paul Osmond, and PDP (aka Paul Pantages). Quite a motley crew. I had some half-thought out ideas about what one should bring on a hike in May. I knew that as one went up a mountain, temperatures went down. But surely, I thought, its the middle of May, and here in Ottawa, trees are budding, grass is growing; it can't be too bad now - we may not even see any snow! My naivete about mountain climates extended to clothing and gear. I looked around at home and came up with what I thought would be reasonable for a hike : an old pair of sneakers with completely worn out and cracked soles, a pair of jeans, a cotton t-shirt, a rain poncho, some sort of jacket, and old polyester sweater (probably the best kit of the bunch), no gloves, and no hat. Furthermore, I convinced most of our group that a similar outfit would be ok for them, and most of them bought that - except for Gilbert, who had actually been on a real mountain before, who knew what it might be like, and who had some more appropriate gear, including a good set of hiking boots, and who suggested bringing a hat and gloves. A hat and gloves, I thought. In May? Bah. Next was a choice of destination. I got out my old 1:zillion scale map of New York state and noticed that in a teeny tiny corner near lake placid 4 trails were drawn into the only mountain listed: Mount Marcy, the highest point in New York state. Great - doesn't look like much of a walk on this map, I'm sure we will all be up to it. I write down all the details in a cocos^H^H^H^H^H^He-mail and send it off to the group. The plans are set; The path of totality was to cross over the adirondacks somewhere around 1pm, and so we make plans to get up early enough (we hope) to drive and then hike to the top so that we make that time. We met in the BNR Meriline parking lot early Tuesday morning and split up into different cars for the ride down. The weather is variable - a bit of cloud, a bit of sun - so we aren't sure if we are even going to get a decent view of the eclipse. I had purchased several pieces of #14 welder's glass so that we could safely view the eclipse. I also brought along my el-cheapo K-Mart 2.5" refractor telescope, tripod and all. Just in case. After driving for 3 hours or so, we all arrive at the Adirondak Loj (that isn't misspelled) parking area. The High peaks information center has some more detailed maps plastered onto the walls, as well as a weather forecast. It talks about snow at higher elevations. It talks about the possibility of non-liquid precipitation. 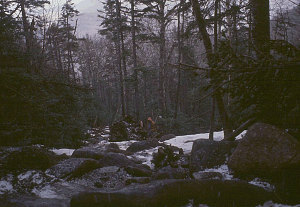 Furthermore, now looking at a proper map of the region, I notice that the hike from this point to the top of mount Marcy is on the order of 13 kilometres. It is now 9:30 am or so. And we have to be at the top by 1pm. 13 kilometres in 3.5 hours?.... 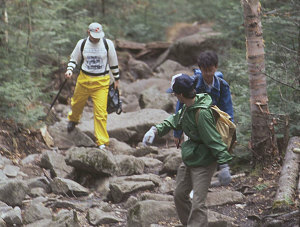 hmmm.... even the mind of a hiking newbie begins to see the light. For the moment I say nothing. I quickly do some scanning and re-assessing. There's another peak here, much closer, and still pretty high. 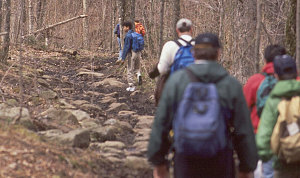 In fact, it is the second-highest point in NY state, and still over 5,000 feet. Worthy enough of our attentions, I thought, and less than 1/2 of the distance of the Marcy hike, too. I quickly explain this new proposal to my teammates, who are quick to agree to this new hike rather than the death slog I had proposed. So, we start. The trail is in pretty good shape - not too much mud, no snow, and the weather is ok, although it is looking a bit cloudy at this point. But, no time to waste. We make pretty good progress, and spirits are reasonably good. My zero-traction, soles-polished-to-a-glaze-with-cracks sneakers start to let in a bit of moisture from the moist ground. By about 11:00-11:30 am or so, we reach the the 3000-foot elevation mark. To my surprise, snow begins to appear here and there. It is distinctly colder. My feet are now soaked. Some of our group start to look a bit haggard. 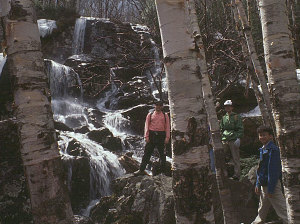 However, we encounter a beautiful waterfall with bits of ice hanging elegantly here and there. We stop for a rocker-esque picture opportunity (see photo). Soon after this stop, the trail becomes solid snow. The temperature continues to get colder, not only from the altitude but from the fact that the moon is now blocking out about 80% of the sunlight. The weather is not getting better. Soon it starts to hail and sleet. I sense a growing unease and haggardness in some members of our group. 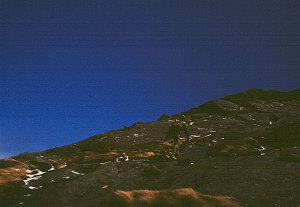 We reach a small col at about the 3500-foot level. PDP curses mightily when the snow he is standing on gives way and he plunges in up to his hips. George is looking a bit dazed but is putting a stiff upper lip on things - I wonder if he is thinking if he is going to get out of this alive.... Time is growing short - we've only got about an hour or so before the eclipse goes total. 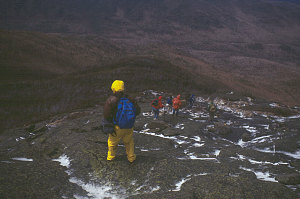 The summit, however, is now about two kilometres of hiking away, and about 1500 feet (500m) up. We are already pretty tired, and it is getting late. What to do? Its all or nothing. Though I do not realize it at the time, it is better for us to keep moving and generate heat, because in our sweaty cotton clothes, we'd freeze if we would have stood around too long. Not long after this point we reach a junction - to a lower side peak, called Wright Peak, that is only 500 metres away and 700 feet lower. I quickly scale back our ambitions and suggest that we climb that instead - there's no way we'll make it to the top of Algonquin in time at this rate, anyway (hey, this whole trip sounds like a metaphor for modern large-scale software design! - inadequate resources, unrealistic goals, not enough time.....). So Wright Peak it is. Off we go on the final portion of the climb, me kicking steps in the snow and ice with my 5-year old worn out sneakers, slipping and sliding and holding on to anything I can find. The trail is getting very steep at this point. Darwin had not yet selected us... not yet. Amazingly, we all reach treeline (at about 4000 feet). We have 500 to go, and we can almost see the summit. The hail and sleet has stopped, and I get to see my first adirondack mountain vistas. Beautiful. The sky is quite dark now (see picture of gilbert on final summit push), and brief glances through the welder's glass reveal that totality is very near. We make the summit during totality, and quickly I pass around the viewing glass that I've brought. It is chilly, windy, blustery - I don't feel like attempting to set of the telescope or my camera, and so I don't have any actual eclipse photos (I've shown someone else's picture of it, though). Although we all marvel (most of us, anyway) at this rare natural event, a lot of us are also starting to get hypothermic. 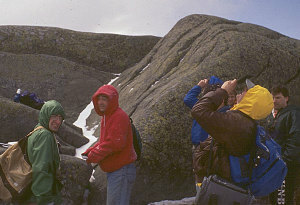 Many of us huddle in the lee of some of the summit rocks to get out of the wind - self-preservation starts to take over. So after a short time looking at the eclipse, we beat a hasty retreat down. It doesn't take us long to get to the relative safety of the trees, and we start to warm up. The effect of the eclipse starts to pass, too, and more and more of the warm May sun warms us up. It would appear that Darwin has decided to let us all pass this time. I resolve to not let him get a second chance. When we get back down to snow-free ground, I can look back and see a glimpse of the top of Wright Peak. I am amazed that all of us managed to get all the way up there and back. It looks so big, so high, and so far away. 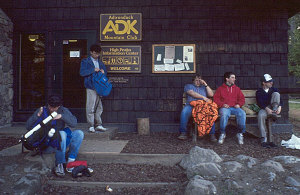 We are a messy, muddy, sorry sight when we arrive back at the High Peaks info center at Adirondak Loj. I think everyone but Gilbert looks quite out of it. Later, sitting in the car on the way back, several of us (George Zhao in particular) have a complete seizure of muscles. When Brian drops him off at his house later in the evening, he is barely able to hobble away. 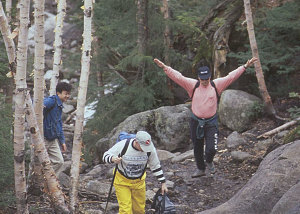 Not long after this day, George left our group, and I'm willing to bet he's not taken up any kind of hiking career. I, having learned my lesson about being prepared for the outdoors, immediately went out and bought proper hiking boots, and some synthetic clothing. There's nothing like a trial by fire to learn a lesson, although I try to let new recruits know how to avoid what we went through. 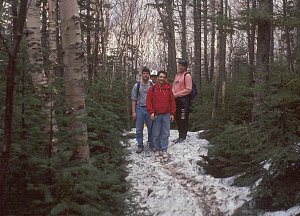 Our group went on to do many more hikes in the adirondacks, and in more far flung places on the globe. Gilbert, Gord, Paul, Brian, and Andree became regulars. 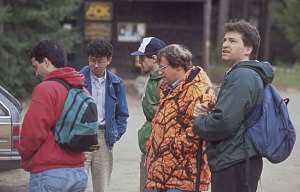 More joined in later years: Markus, Ewart, Lorraine, and many others. They didn't expect this kind of outing, did they?